Nadal proves he's the undisputed clay court specialist by winning his third consecutive titles at the Monte Carlo Open. In my humble opinion, today's match is his best match of the week by beating Roger Federer 6-4, 6-4 in just 1 hour and 35 minutes. Fedex made a lot of unforced errors and looked rather tired during the game. I don't think he believed he can beat Nadal on clay. 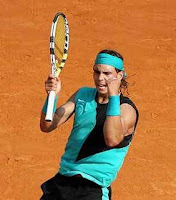 Hence, this victory means Nadal has 67 consecutive wins on clay court. So, he's pretty much the man to beat in the up coming Rome Open.